TAKE A JUBILEE WAGON . . . .
…remove the body, and you are left with a useful underframe which can be used as the basis of home made rolling stock. This has been done by a number of firms, both quarry companies and others, who have found such wagons easy to obtain. Joseph Arnold & Sons Ltd and George Garside (Sand) Ltd who between them provided the traffic and rolling stock for the 3½ mile Leighton Buzzard Light Railway in Bedfordshire, owned a number of such conversions. The simplest conversion of all consists of laying planks across the frames whilst leaving open the semi-circular ends, and this effectively forms a flat wagon suitable for carrying sleepers and similar material. Handrails are sometimes fitted at either end to make the wagon more easy to push. Quarry excavators need fuel at frequent intervals and often access to them is difficult. To meet this problem Garside's had several wagons with cradles to carry fuel oil drums, a hand pump being provided at one end to facilitate transfer of fuel to the excavators. 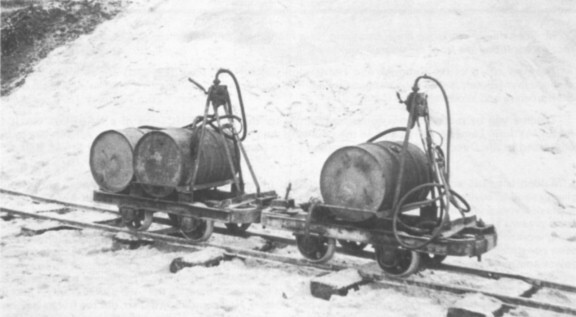 Another method of conveying fuel to similar sites was to mount a rectangular tank on a wagon underframe. Occasionally excavators broke down and had to be repaired in the quarry. This was particularly true at Garside's in the years around 1960 when much of the equipment was in need of replacement, so they fitted a Simplex petrol locomotive with a vice and a large toolbox on the running board. This meant that a small portable 'workshop' could be quickly taken to the failed machine. Did anyone ever get a photograph of FESTOON so fitted? On some occasions welding was necessary and portable welding apparatus was also taken along. 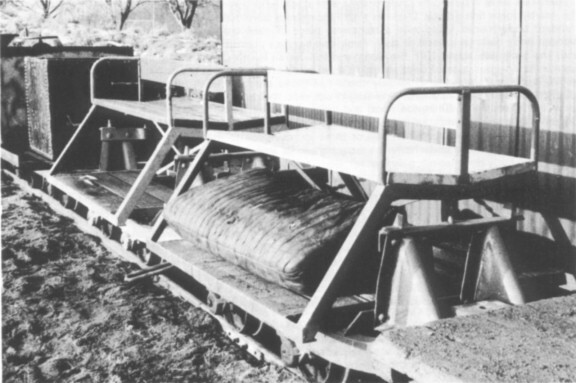 This equipment had small castors fitted for workshop use, totally impracticable in a sand pit, so a carriage truck was made for it, this consisting of just an underframe with horizontal pieces of channel steel on either side to carry the castors. Arnold's had a similar truck to carry an air compressor fitted on a two wheel trailer, and this was used to supply air for rock drills when blasting was required. Neither carriage truck now exists: Garside's new excavators rarely need welding in the field and Arnold's replaced their truck with a Simplex loco (No. 21) rebuilt into a self-propelling air compressor. Garside's were required to transport sacks of dried sand from their drying plant at Billington Road to the nearby main line sidings. Over the years their shops built four bogie flats for this traffic, consisting of standard underframes fitted with a transverse piece of steel channel as a bolster. On this rested the flat wooden body built on a wood or steel frame, and having a corresponding steel channel crossmember at each end: the body was about 13ft 6in long, and the overall length of the wagon about 15ft 6in. They carried approximately four tons of sand. 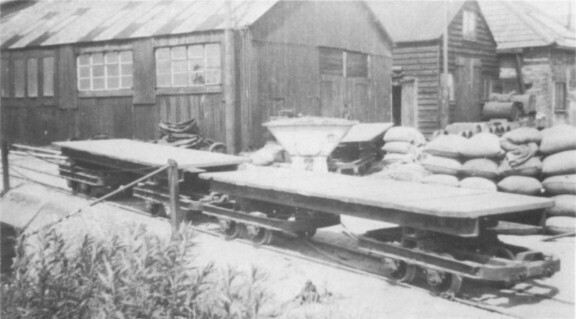 Arnold's dried some of their sand at the quarry, and carried it in sacks on ex-WD bogie open wagons. Originally these had brake pillars on each bogie but after some years on the LBLR the brakes were removed. One wagon was rebuilt into a bogie flat around 1960 to carry bulldozers between the smithy at Billington Road and the quarries. A steel bar across each end provided support for a pair of steel channel ramps (with wood inserts) to enable the vehicle to be driven aboard. The floor of this wagon never lasted for more than two or three journeys due to the combination of weight, age, and the effect of twisting of the underframe on sharp curves. Its replacement was rather regular! In 1959 Garside's built a pair of six wheel bolster wagons from steel channel and Hudson spares to carry a new 21 ton sand dredger pontoon. Luckily, the route was reasonably straight, but even so it must have presented quite a sight - especially the unloading which was achieved by pushing the loaded wagons down a siding which terminated below water level. These wagons had a short wheelbase and centre wheels which were flangeless. The most unusual home made wagon was Garside's crane wagon. Constructed from steel channel and angle on a lengthened jubilee chassis weighted with scrap bullhead rail, it had a jib about 9ft long fixed to give an effective radius of 7ft 6in although the jib could be lowered for travelling. Its last job was loading up scrap when the dump of withdrawn petrol locomotives at Billington Road was cleared in the 1960's. Now it is owned by the Leighton Buzzard Narrow Gauge Railway Society and has been rebuilt on a Simplex loco chassis to improve stability. Robert Hudson Ltd., manufacturers of light railway equipment, appear to use standard underframes as a basis of a number of wagons, a steel open (Garside's navvy spares wagon) and a wooden slotted side open ammunition truck now used on the Cadeby Light Railway to name but two. End tipping wagons are made by mounting a standard side tipping wagon, complete but for wheels, across a second frame. The standard 2ft gauge jubilee side tipper has been used on lines of other gauges, mounted complete on a new underframe - examples include the 2ft 3in gauge Talyllyn Railway and the 4ft 3in gauge at APCM Sittingbourne. The 2ft 11in gauge line at P.W. Spencer Ltd., Lothersdale Limeworks in Yorkshire used wagons which appeared to have been originally 2ft gauge and fitted with extended axles so that the wheels were outside the frames and the bearings inside. Frames of jubilee wagons have been used for four wheel coaches, with either longitudinal or transverse seating, and also as the bogies on larger vehicles. The largest such vehicle I have seen is a five coach articulated unit (fitted on six underframes) at Billing Aquadrome. The jubilee wagon thus forms a useful source of rolling stock components and as such is a very versatile piece of equipment.